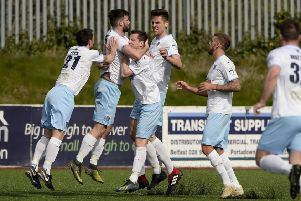 Ballymena United manager Glenn Ferguson praised his players for a “professional” performance in Saturday’s Irish Cup fifth round win over Crumlin Star. Stephen McBride in action for Ballymena United in Saturday's Irish Cup win over Crumlin Star. “I’m happy with the result. It was a professional job. “Those matches can be a bit of a banana skin and traditionally, in the past, when we have played so-called lesser teams, we haven’t played particularly well. “Anything can happen in the Irish Cup because teams raise their game but I thought we dominated the game, passed the ball well and had some good individual performances. “They had a great effort which hit the crossbar but outside of that, I don’t think Stuart Addis had too many saves to make. “It was good to get four goals and to get Jim Ervin and David Cushley some playing time on their return from injury. “We have real competition for places with other players coming in and everyone knows they have to be on their toes to stay in the team. “Jim Ervin knew exactly the rehab he had to do and he has done it right and he has come back maybe three or four weeks ahead of schedule but he knows exactly when he’s ready. “To have a good experienced player like that who’s been out for so long really is like having a new signing. “Tippy has shown, playing week in, week out, how good he can be and Allan and Stephen have been steady performers for us all season. Steeky’s stomach muscle injury seems to have cleared up and he is good at getting up and down the pitch,” added Glenn.